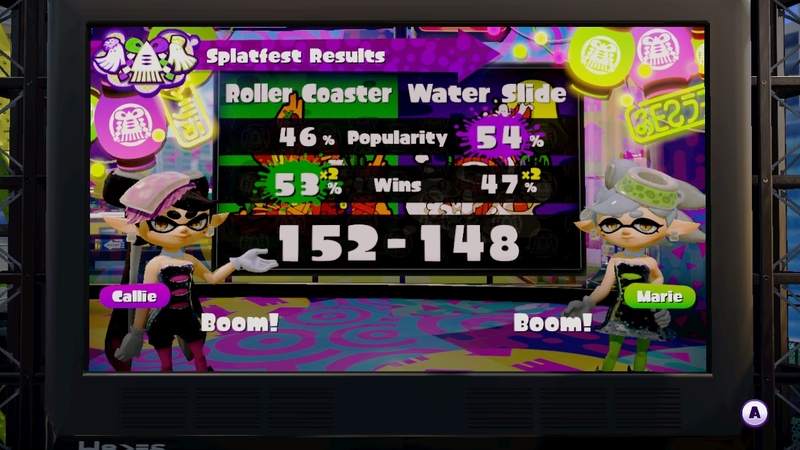 I couldn’t really get in to the Roller Coaster vs. Water Slide argument, so I picked Team Roller Coaster and played long enough to rank up a couple of times. I didn’t have enough emotional attachment to the issue to stick with it very long. Turns out I picked the winning side, anyway, and even my half-hearted contribution meant that I wound up with another 10 of the Sea Snails you can use to respec gear, so I have quite the virtual bankroll now. I just need to figure out which of the stats are actually ones I should be focusing on, and it’s more complicated than I’d thought. For example, now that Ink Resistance has been nerfed changed, I should actually try to figure out which main abilities for shoes might be better. This entry was posted in videogames, WiiU. Bookmark the permalink.